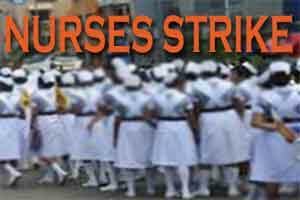 Thiruvananthapuram: Opposition Congress and BJP asked Kerala government to take urgent steps to end the indefinite strike by a section of nurses of private hospitals demanding wage hike. The opposition parties urged the government to ensure decent wages to the nurses working in private hospitals, who play a significant role in the state’s health sector. In a letter to Chief Minister Pinarayi Vijayan, opposition leader Ramesh Chennithala said fever and other contagious diseases were spreading across the state and the indefinite strike by private nurses would further worsen the situation in the state health sector. “Even the construction workers are getting Rs 900-1000 as daily wages in the state. At the same time, nurses, who are involved in life saving activities, are given only Rs 400-500 as daily wage,” he said. Private sector nurses were drawing a monthly salary of just Rs 9000-12000, he said, adding, Chief Minister should intervene into the issue immediately to end the agitation and to the increase their wages. BJP national executive member V Muraleedhan said the LDF government was not taking any steps to end the nurses’ agitation and it is to help the private hospital lobby. He said the Modi government at the Centre had already enacted a law to ensure at least Rs 20,000 as monthly wages to the nurses working in 50 bed-hospitals. The state government was not implementing the law, despite repeated directives of the Supreme Court in this regard, he alleged. The nurses of the private hospital began an indefinite strike state-wide on June 28 after the hospital managements rejected their pay revision demand.